On October 17, 1949, twenty-four retired teachers met in the Ohio Fuel Gas Company Auditorium in Springfield, Ohio for the purpose of organizing an association for the mutual benefit of teachers who have entered retirement. 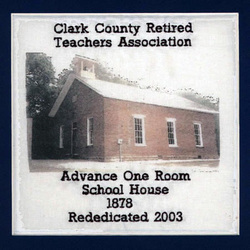 One week later, October 24, 1949, the group of retired teachers chose the name Clark County Chapter of the Ohio Retired Teacher Association. The constitution was approved and after the new officers were elected, they took over immediately. Annual dues of $.50 were agreed upon.Early meetings were held in various community buildings and member homes. Two general meetings proceeded by executive board meetings were held each year. In 1970 CCRTA had over 200 state and local members, entitling it to a state trustee. The luncheon setting format began and the luncheon cost was $2.00 at St. John's Evangelical Lutheran Church. In 1989 the Clark County Courier newsletter was begun and the computer was first used. Also, this year "The Honored Member Program" began erasing dues for those 85 years and older. In 1996 a scholarship program was inaugurated and the first award of $500.00 was given in April. The program has continued through the years and in 2006 the scholarship awards rose to $1,000.00 each. In 2000 dues were $220.00 for dual Life membership in CCRTA and ORTA and in 2001 they were raised to $380.00. With the hard work of members, the Advance One Room School House, built in 1878, was acquired by the Chapter in 1999. After raising the necessary money, the school was totally restored and rededicated in August, 2003. To meet the cost of maintaining the school a Car Cruise In was begun in 2003 and has been held annually. One Room School Volunteer Teachers greet 4th grade students of Clark County for a step back in time and an experience in 1878 history. Webmaster, Sandy Kachurek has also created a site Advance One Room School that visitors will enjoy.